In an age before births were jotted down in church registers, Henry de Montfort (1238-1265) has the distinction of being one of the few people of the Middle Ages whose birthday has been preserved. Matthew Paris thought fit to note it at the time because the queen was still childless after nearly three years of marriage. Since young Henry was the firstborn son of the king’s sister, Paris was relieved that the royal succession was assured into the next generation. He had apparently forgotten all about Henry’s other nephew and namesake, Henry of Almain, born three years earlier to his brother Richard of Cornwall. Paris was also wrong in dating the birth of the newborn at Kenilworth to 28 November. He was probably born two days earlier, based on the king’s itinerary. Henry left Woodstock on 26 November and covered the entire 34 miles to Kenilworth in one day. Apparently he wanted to be present at the baptism of the baby, perhaps serve as one of the godfathers. The prelate who performed the ceremony was Alexander Stavensby, the bishop of Coventry and Lichfield. A few years earlier he was among the bishops who threw their spiritual support to Richard Marshal during his insurrection. Since that time, the bishop had gone out of his way to rehabilitate himself in Henry’s eyes. Paris says that Stavensby became ill while baby Henry was still in the font. He recovered from whatever it was, but died a month later in Andover. The next mention of Henry de Montfort is connected to the disgrace of his parents. In August 1239, at the purification ceremony of the queen, the king turned on his sister and brother-in-law in a fury. The issue was money, but it reminded Henry of all he had endured on account of their marriage. So fearful was the couple that they left immediately for France, leaving their infant boy with his wet nurse. In April 1240 Simon de Montfort came back to England to raise money for his crusade and also to retrieve his son. Eleanor was not with him because she was probably then about to give birth to their next child, Simon. Henry de Montfort was a six-year old when, on 1 April 1245, his parents brought him and his younger brother Simon to Waverly Abbey, a medieval family off to church. In this time he was also a sometime playfellow for his cousin Edward, who was seven months younger. For his education, Henry was sent together with his brother Amaury, Simon and Eleanor’s third son, to the household of one of the most learned men of the century, Robert Grosseteste, the bishop of Lincoln. From this connection grew the legend, recited by Rishanger, that Grosseteste saw the future in the lad’s eyes and told him that he would die on the same day as his father, in the cause of justice. Grosseteste no doubt found time to impart practical instruction as well, for Henry had learned his letters. The surviving copy of his father’s will is written in his hand. Henry came of age during his father’s controversial tenure as the viceroy of Gascony. In 1252 Henry III put Simon de Montfort on trial over his harsh administration. He was acquitted by a panel of his peers, but feeling aggrieved, he returned to Gascony to have his revenge and took his 13-year-old son with him. When the reform period started in 1258, Henry was 19 but does not seem to have had any marriage prospects. His father was at the forefront of the movement, which aimed to exile the king’s Lusignan brothers. After the brothers fled to Boulogne on the continent, young Henry gathered up family and friends to besiege them in their holdout. Nothing was reported to have come of it, and Henry returned to service under his father. By this point Edward was a radical for reform and increasingly under the sway of his uncle Simon. He knighted his cousins Henry and Simon and took them to tourney in Gascony. The war that broke out in 1263 forced them to choose sides. When Edward found himself bottled up in Gloucester, he promised Henry that, if let go, he would respect a truce. He did no such thing and Henry’s naiveté brought him much ill-will from his father and allies. At the battle of Lewes in May 1264, the 25-year old Henry was in the van on the right wing, directly opposite his uncle (godfather) the king. After the victory of the Montfortians, Henry was charged as Edward’s jailer, putting him first in Dover before moving him to Wallingford. He and his brothers then took up key assignments in the provisional government, mostly as wardens for the Channel ports. Two royalist chroniclers see their work as a family racket, especially the charge that they (and their father) allowed piracy to flourish in return for one third of the booty. In the international boycott that threatened the regime, Henry was made the wool czar, but Wykes acidly calls him a ‘wool merchant’ as an insult to his knightly status. Where Henry and his younger brothers caused their father his biggest headache was in their needling of Gilbert de Clare, the earl of Gloucester and Simon’s partner in government. They challenged the touchy, red-headed Gilbert and his brother Thomas to a tournament at Dunstable, but Simon banned it and warned his sons, according to Rishanger, that if they ever tried something like that again, he would lock them away where they would have the benefit of neither sunlight nor moonlight. In March 1265 Edward was officially ‘released’ from captivity, but in fact could go nowhere without Henry, again his minder, dogging his every step. During negotiations between Simon and Gilbert, Edward gave his cousin the slip while out riding near Hereford, raised an army with Gilbert’s backing, and forced a showdown at Evesham. 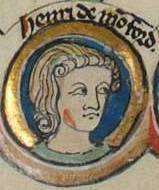 Henry de Montfort, described by Robert of Gloucester as a ‘gentle knight’, was slain together with his father and most of their host. It was said that Edward attended his funeral at the abbey church, even cried during it. Edward was an emotional character with a fine sense of family and memory, but he also knew that the mutilation of his uncle’s body at the battle may have unleashed a blood fe ud with the Montforts. Crying over Henry de Montfort may have been his way of making amends, at least to his aunt. Whatever disappointment Simon may have felt in his first-born son, Henry got off better than his brothers did in the hands of later writers. Whereas the younger Simon died cursed by all and Guy stewed in a river of boiling blood, Henry was the subject of at least two flowery romances in the 19th century. ‘The Brides of Dinan’ doesn’t have him uttering the Provisions of Oxford in his dying breath, as Grosseteste might have wished, rather his love of a young girl attending, of all people, Maud Mortimer, the wife of the man who oversaw the mutilation of Montfort at Evesham. In ‘The Prince and the Page’ he survives Evesham only to end up as a blind beggar who scrapes together a fortune for his daughter’s dowry. This story got its basis from the ‘Blind Beggar of Bethnal Green’, a Tudor ballad that has Henry begging for that dowry. 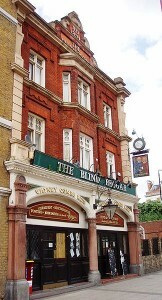 There are Blind Beggar pubs in London and Calgary today named for this aspect of his legend.